Add a unique and stylish accent to your home with PID Floors Wood Floor 6 in. Decorative Border Inlay MR001. This beautiful border is made from real hardwood and can be installed into any solid or engineered wood floor, above, on, or below-grade. A decorative inlay will add value and warmth to your home or office, and can be used in a residential or commercial space. Each piece 4 lin. ft.
Top hardwood layer of 5/16 in. 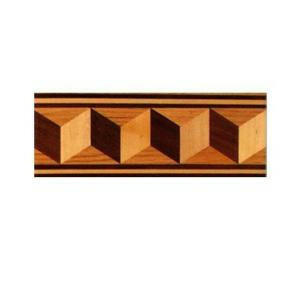 Buy online PID Floors Cubes Design 3/4 in. Thick x 6 in. Wide x 48 in. Length Hardwood Flooring Unfinished Decorative Border MR001, leave review and share Your friends.